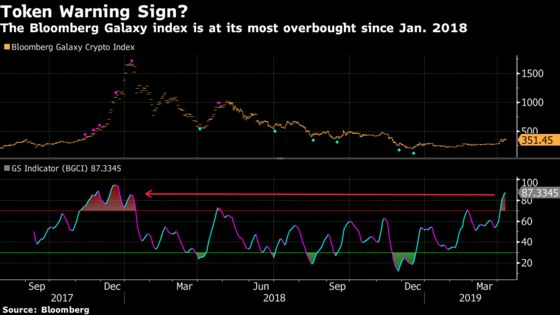 (Bloomberg) -- The signs portending renewed pain ahead in the crypto world are piling up, with a technical indicator showing the Bloomberg Galaxy Crypto Index at its most overbought since hitting a record last year. A recent rise in the index, which coincides with a surge in the prices of some of the largest cryptocurrencies, has brought it to its most expensive level since January 2018, according to the GTI Global Strength Indicator. The last time the index reached a similar level coincided with its 2018 peak of $1,667 on Jan. 8. It dropped more than 65 percent over the subsequent three months. Though the Bloomberg Galaxy Crypto Index, which tracks many of the largest digital currencies, is up about 25 percent since the start of the month, it’s still down close to 80 percent since it hit its all-time high. Bitcoin, Ether and XRP make up a majority of the index with near-equal weightings: Bitcoin comprises 30 percent, while XRP and Ethereum make up 28.3 percent and 27.8 percent, respectively. Bitcoin and Ether are each up more than 25 percent since the beginning of the month, while XRP has rallied around 15 percent.